I’m a second time mom, who is amazed at how much easier babywearing makes my life. I wore my first son when he was an infant, and firmly believe that he would have been called “colicky” by anyone who wasn’t a babywearer. Practically the only time he was happy was when he was being worn! It was a rough transition to motherhood, but I was grateful for the relief that my stretchy wrap provided. This time around, my baby is easy-peasy, but babywearing has come to the rescue because it allows me to meet the needs of both of my children at the same time. My almost-4-year-old can be on the go, and we can easily keep up because the baby is wrapped to me. I don’t have to wrestle with the stroller, or find a new spot in each room to “park” the baby while I care for or play with his older brother. The baby is insanely happy to be held and to be included in the action. He loves watching his brother, going on walks, and interacting with whoever glances in his direction. In this photo, we are in South Bethany, Delaware, where i have gone each summer for the last 30 years. We are with my extended family. I’m wearing a DIY water ring sling: I purchased 2 yards of athletic mesh, cut it lengthwise, and made it into a ring sling using nylon rings from slingrings.com. I followed the safety guidelines from Jan Andrea’s Sleeping Baby Productions website in order to make sure I was creating a safe carrier. I sold the other half of the fabric, so this carrier ended up costing around $15 total! I chose to showcase this photo because its the most modest carrier in my collection, yet it still accomplished the most meaningful aspects of babywearing – keeping my baby close, safe, and included. Another bonus of a water ring sling is that it can get wet or sandy and remains very comfortable to wear. I didn’t go into the ocean with my baby, but we did take lots of walks in the surf, and we waded in pools and in the calm bay. The carrier got two HARD weeks of use, and still looks brand new. It was the best $15 I spent all summer. Babywearing at the beach meant that I didn’t have to worry about putting my 4-month-old down into the sand, or bring a special tent to shield him from the elements. I could take him into calm water without worrying about dropping him, and without getting tendonitis from bearing his weight on my arms. The sling also functioned as sun protection – I was hesitant to put too much sunscreen on him, and he didn’t get any suntan at all! 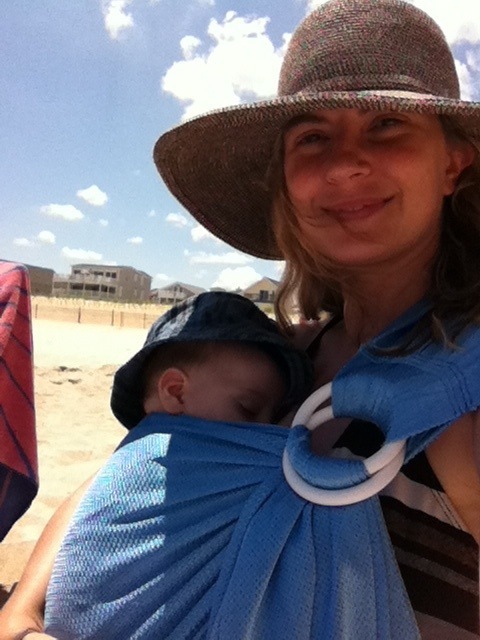 It allowed me to nurse in a bathing suit without feeling overly exposed (the tail of the ring sling can also be used for coverage if needed). The biggest bonus for me was feeling totally included in the family activities. The baby and I were comfortably part of all the fun! I babywear in general because I feel that it is a sign of respect to keep a baby close and engaged rather than separated & distracted. I feel that it lets him know that I value him as a person, and want him to understand and experience the world around us, while remaining secure and protected. I can teach a baby 1000 things a day just by wearing him in my normal life – no need for flashcards! It also floods me with endorphins – I feel like I get hundreds of bonus snuggles every day through babywearing. It has really defined my experience through this phase of motherhood. Great job, momma! What type of thread did you use to sew the rings into the shoulder?